In an earlier post, I wrote about the early bulkhead cars SP built in 1949 at its own Los Angeles shop from existing flat cars of Class F-70-6. Here’s a link to that post: http://modelingthesp.blogspot.com/2011/09/early-sp-bulkhead-flat-car.html . My emphasis in that post was on the HO scale models of the 1949 cars, then being introduced by the Southern Pacific Historical & Technical Society (SPH&TS). Now I want to carry the subject further. I will begin by showing the prototype 1949 bulkhead on the left, and on the right the as-built but unpainted SPH&TS bulkhead, constructed from the kit. Grab irons and ladders had not been added to this model bulkhead, so that the construction arrangement would be as clear as possible. This is the bulkhead style shown in my prior post, with the link above. The SPH&TS offered the combined F-70-6 flat car, and the 1949 bulkheads, as a ready-to-run car at one time. Just to show how this looks as a completed car, here is the superb photo taken by Paul Lyons of one of these models. Society members will have seen this photo as part of the promotion for the models. In the years after 1949, SP found demand increasing for bulkhead cars, and continued to convert flat cars in its own shops for this use. Originally intended to carry plasterboard, and heavily used for that traffic, the cars also soon found use for a wide variety of other cargoes, including lumber. There were minor changes to the design of the bulkheads in the years between 1949 and 1956, but in that year an entirely new bulkhead design was introduced, completely of welded steel except for the vertical face of the bulkhead. This was followed in 1962 by an SP design which was structurally similar but considerably taller, 8 feet, 6 inches above the car deck, instead of the previous height of 6 feet, 4 inches. (Some 1949 bulkheads were less than 6 feet high.) Not only did SP build this 1962 design in its own shops, but later provided blueprints to Gunderson and others to construct new, not rebuilt, cars with this same bulkhead. Accordingly, it’s an important bulkhead for 1960s and later SP modelers. As I’ve stated above, the SPH&TS is about to introduce kits for both the 1956 and 1962 bulkheads. These are much like the 1949 bulkhead kits which are still available (see link above) in that they comprise styrene parts which are easily glued together and attached to a styrene car deck (they are not designed to be attached to wooden model decks). 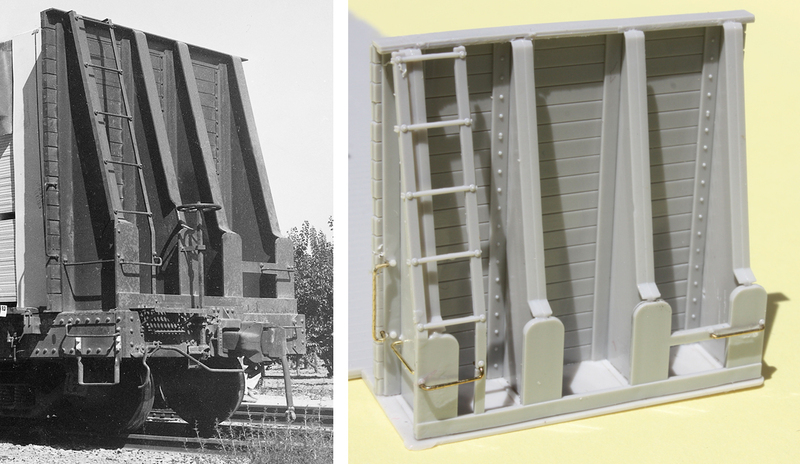 For modelers of a range of eras, these fine bulkhead kits permit creation of a distinctive Southern Pacific freight car. Tony, I apologize if this has already been answered, but were similar (identical?) cars built for SSW? Thanks. Dan, I'm not an expert on the Cotton Belt, but as late as the early 1960s, the answer appears to be "no." Cotton Belt did build a lot of bulkhead-type cars for pulpwood loading, but these had the usual slanted decks, canted inwards, and would not have been suitable for plasterboard or lumber, which was usually loaded and unloaded with forklift trucks. In later years, it's possible that SSW did purchase bulkhead cars like the SP cars, but I don't have photos or documentation one way or the other. I would think that plasterboard would need to be kept dry. Were these loads covered by tarps or something? Randy, many photos show the loads in the 1950s as uncovered. These were probably destined to places where rain was considered unlikely, such as Southern California in the summer. You are right, of course, that the plasterboard MUST not get wet. It was not many years before the paper and/or plastic wrapping for these loads became standard, even for dry destinations. I will say that I have never seen a photo of a plasterboard load under a tarp, but that doesn't prove it didn't happen sometimes.